Banaue is in the Province of Ifugao, and the locals will always correct you when you mistakenly call them Igorots. The Igorots are from the Mountain Province. They call themselves Ifugaos. The Banaue Rice Terraces made it to the Unesco World Heritage List in 1995. I remember that in grade school, we were told by our teachers that when placed end to end, the terraces could circle half of the globe. Locals derive income from farming, and from the tourism industry. Lately, the Department of Agriculture has taught some of the farmers to raise fish, instead of growing rice, on the terraces. 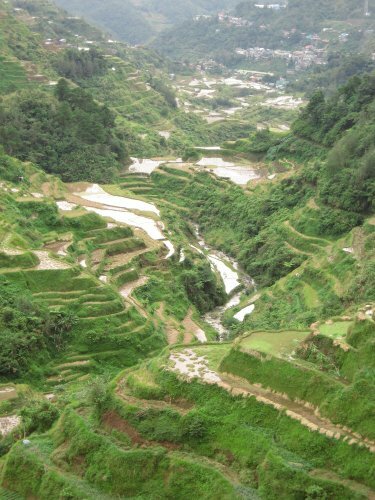 We might soon have the Banaue Fish Terraces, and officially make it the 8th Wonder of the World. Banaue is 348 kms north of Manila. Travel to Banaue starts at the North Luzon Expressway. To skip the traffic in the Bulacan towns, take the Subic-Clark-Tarlac Expressway (SCTEX) and take the farthest exit in Tarlac where you then turn to the direction of Nueva Ecija. You will pass the town of Zaragosa, and eventually hit Cabanatuan where you go north to Nueva Vizcaya, passing thru the mountainous but picturesque Dalton Pass in Sta Fe. There are restaurants on this mountain road, and you may want to try the local delicacy “tapa ng baboy ramo”. From Sta Fe, the next towns are Aritao, Bombong, Bayombong and Solano. Next is Bagabag from where you turn to Lamut, leading to Lagawe, the capital of the province of Ifugao. 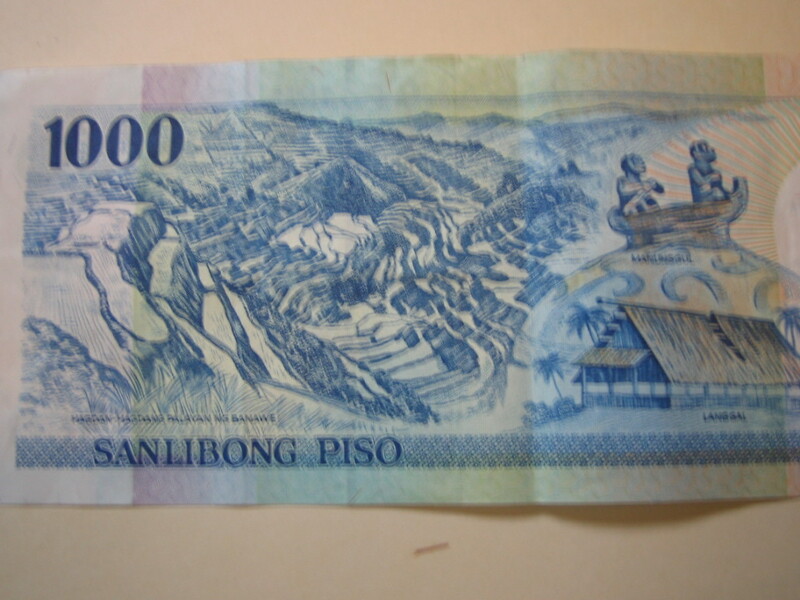 You will shortly be in Banaue on a trip that is approximately 8-9 hours. On a trip with my visiting brothers and only sister and their families, we proceeded immediately, tired from a long journey, to the Banaue Hotel and Youth Hostel, and got ourselves 3 rooms. The hotel is the best in town, and is operated by the Department of Tourism. The restaurant has picture windows with a view of the edges of the terraces. A first-time visitor might even think that this view is THE view.. Far from it. There is a bar adjoining the restaurant. A souvenir shop can be found at the lobby, and at the second level. 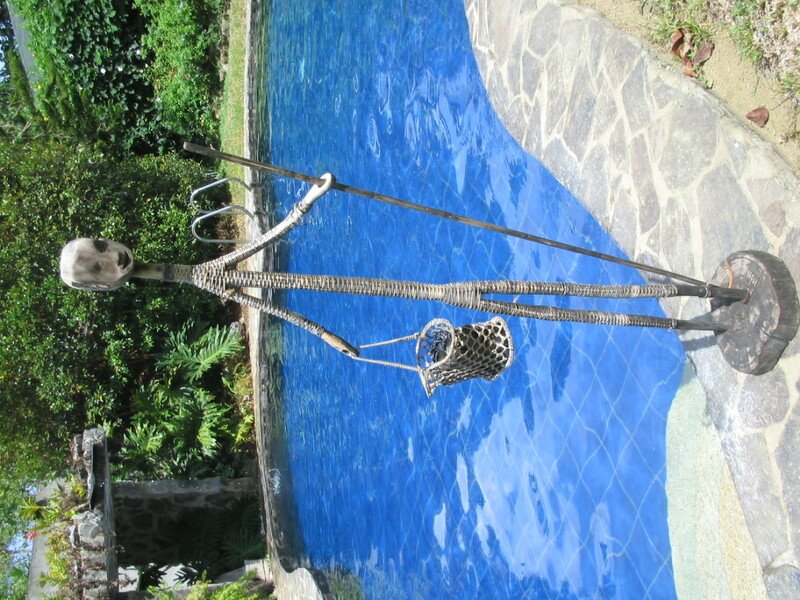 I bought a woodcarving of a stickman which I couldn’t find in the stores at the town center. 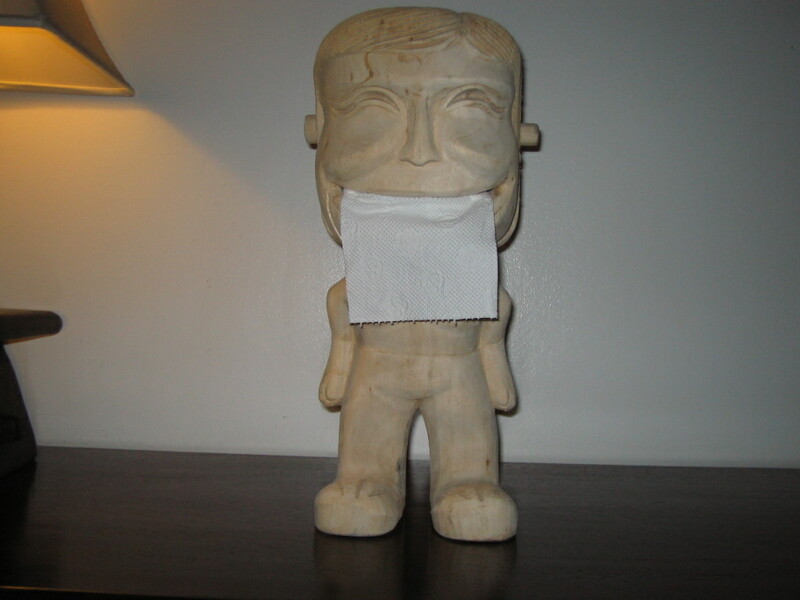 Finds: I also bought an interesting woodcarving of a man where the toilet roll can be made to go out of its mouth. 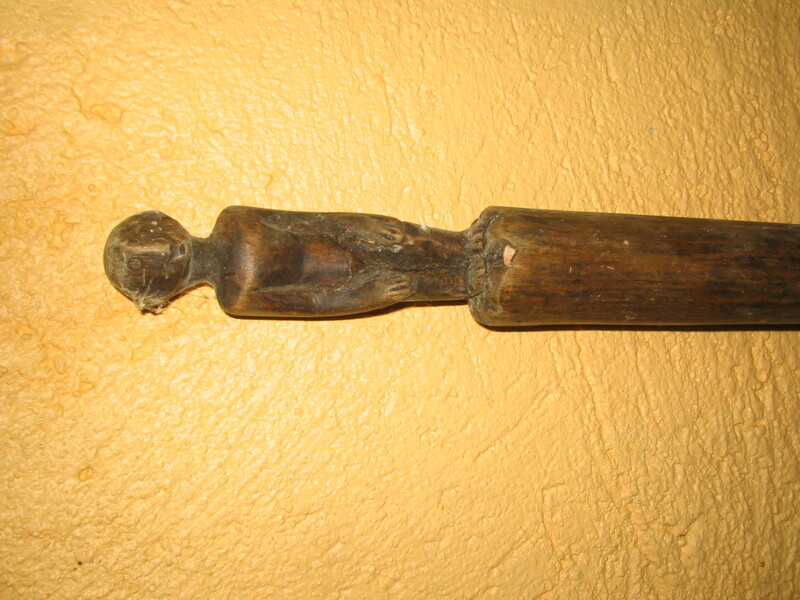 And a sturdy wooden cane with a “bulol” on its head. 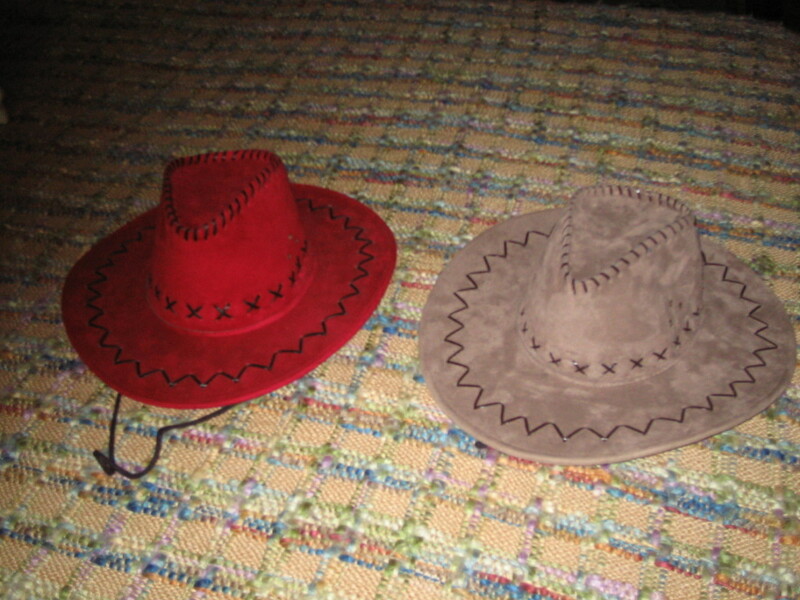 At the second level shop, I bought two pieces of hats, red and grey. The canes can be handy in 20 years time, I guess. Meanwhile, they stand as accent pieces near my bar. There are several viewpoints offering different angles of the terraces rising nearly 5,000 feet above sea level. When the Miss Universe pageant was held in the Philippines and won by Dayanara Torres of Puerto Rico (she became the girlfriend of local actor Aga Muhlach), the Department of Tourism brought her up to Banaue and photographed her with arms outstretched presenting the beauty of Banaue Rice Terraces in posters and other merchandising materials created to promote tourism in the country. These days, the locals have misspelled her name, and the signage in that spot now reads “Dianara Viewpoint”. On previous trips, when I was younger and more agile, I trekked to the Ifugao villages of Battad and Mayoyao. Battad is the easiest trek, and most accessible. My then girlfriend (now my wife) and I even donned Ifugao costumes for rent, and posed for photos, back when there were yet no digital cameras. There are several inns within the town center and this area is like backpackers’ haven. Cheap accommodations, lots of cheap souvenirs, cheap food. On a separate visit with travel buddies, I stayed at Sanafe Lodge. On my latest visit, I saw the lodge and I can say it is still the best within the town center. Sanafe Lodge has rooms that are rented out at P600 single, and P750 double or twin. They can be reached by phone (+6374) 3864085, mobile +63920 9504644. Good value, clean rooms with private toilets. I write about this aspect in a travel blog to make sure you bring all of your medicines and other provisions with you. Medical services practically do not exist in Banaue. When my sister needed a doctor, she had to wait for the one and only doctor in town who was then attending to an emergency. The nearest hospital is the Provincial Hospital in Lagawe, the capital town of the Province of Ifugao. You must scale down your expectations to the ground. Lagawe, the capital town, is classified as a mere 4th class municipality. As my sister was being attended to by the doctors, I went to the toilet but turned back because it was so dirty and had a pungent smell – – and probably the best comparison will be those of toilets in public markets. The skilled and very attentive doctor, who as it turns out was a very young Assistant Medical Director, made up for the very bad condition of this health facility. Bottomline, only the healthy should go to Banaue. 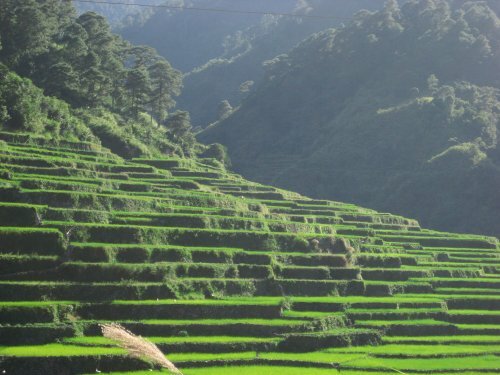 Banaue to Sagada via Bontoc? 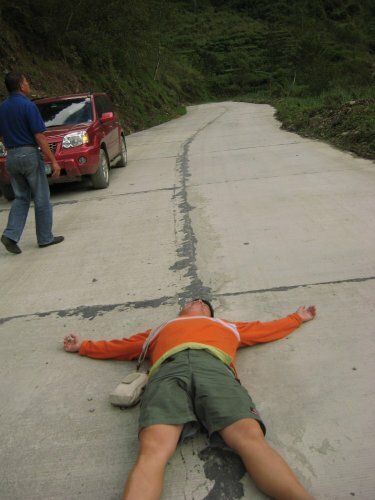 You can go to Sagada via Bontoc on a highway with deep ravines. I took this road with some friends from Yahoo, riding a Nissan X-trail 4×4. A typhoon has just passed, damaging most of the road. Some portions were then even under water. I admit that the thought of whether or not we will actually get to Bontoc crossed my mind at least 10 times. I managed my nerves by just savoring the view. Long stretches of unpaved roads, interrupted by short stretches of concrete. I even laid down on my back, right in the middle of the road, because there were no other vehicles, no people, and no nothing that could soothe my then frayed nerves. I just had to make light of the “difficult situation”. This road is mine ! However, friends tell me that, now, the roads are vastly improved. Hopefully, the government indeed worked fast enough from that visit I took 17 months ago.